Discussions Magazine Music Blog: THE TURTLES - Spaz reviews the fab new reissues on Manifesto Records! THE TURTLES - Spaz reviews the fab new reissues on Manifesto Records! To be fair, The Turtles do get a fair share of recognition but just not as much as they deserve. There seems to be two different tiers when people think about the most influential ‘60s Rock bands – the first is the Beatles/Beach Boys/Rolling Stones/Kinks/Who tier while the second tier consists of ‘everybody else’. And as you know, that second tier is definitely crowded: The Byrds, Buffalo Springfield and many others are up on top of that level, enjoying constant reappraisal and critical attention. However, buried amongst those fighting for a chance to breathe are The Monkees, Herman’s Hermits, Dave Clark Five, The Four Seasons and especially The Turtles. Their lack of a cohesive image – they were Carnaby Street and a carnival at the same time. Their need to constantly challenge themselves and try new musical avenues - The Turtles borrowed so liberally from many genres over the course of their career meant that they just confused the public, who just wanted to hear endless variations on “Happy Together” rather than original, thought-provoking music. Their inability to take themselves too seriously - they pretty much pushed the envelope so often that people didn’t know whether to accept them as Pop/Rock saviors like The Byrds or dismiss them as disposable Pop playthings like Freddie & The Dreamers. 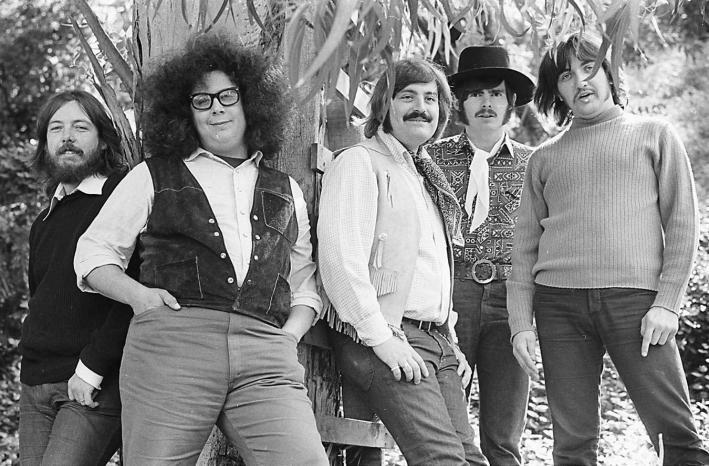 The Turtles had a tendency to be too weird for Top 40 radio on occasion. But I mean that in a groovy, far-out weird kind of way. Lastly, it certainly didn't help that their back catalog had been in and (mostly) out of print over the years with only hits compilations available at any given point. But guess what? Thanks to Manifesto Records, that has all changed. This great label that gave us – among many other cool releases – the Lee Michaels box set (which is still on my list of things to buy) has resurrected The Turtles in style with two sets that will more than satisfy longtime fans and introduce a new generation to their gloriously irreverent hit-making ways! ALL THE SINGLES is a two CD set that features all of the band’s A-sides and B-sides along with some other gems, such as tracks prepared for single release but abandoned at the time. For the most part, this set features the crunchy, direct mono mixes that we all loved to hear blasting out of AM radios all those years ago. I myself have never preferred mono mixes over stereo versions but I’ll have to admit that lately, I’m understanding just why there are many folks that do – these songs come out swinging in mono and they seriously rattle your cage for three minutes (approximately) . Just listen to “It Ain’t Me Babe,” “Your Maw Said You Cried,” “You Baby,” “She’d Rather Be With Me,” “The Story Of Rock ‘n’ Roll,” “You Showed Me,” “You Don’t Have To Walk In The Rain,” “Elenore” and “Happy Together” in mono and you’ll know what I mean. In stereo they are fantastic, but in mono, they have more attitude and hit harder. Those wanting to sample The Turtles before diving head first into their deliciousness should start here: forty-eight tracks that will tickle your fancy! Thankfully, the other set – see below - doesn’t necessarily make this collection redundant, so you can snuggle with both at night if you’d like. I know I do! THE COMPLETE ORIGINAL ALBUM COLLECTION is really the one you need to fork over your hard-earned dollars for if you are trying to choose between the two (although I still say go for both!). This box features six CDs, all jam packed with Turtle-y goodness. The discs for the first three Turtles albums – It Ain’t Me Babe, You Baby and Happy Together – feature the stereo and mono versions of each album, which is great for guys like me who prefer stereo mixes for headphone listening but love to blast the mono versions out of the speakers and shake up some cojones in the process! The next three discs – The Turtles Present The Battle Of The Bands (their finest full length, by the way), Turtle Soup and the odds ‘n’ ends compilation Wooden Head – feature the stereo versions of the albums plus a plethora of rarities. These discs are jam-packed with goodness, man. 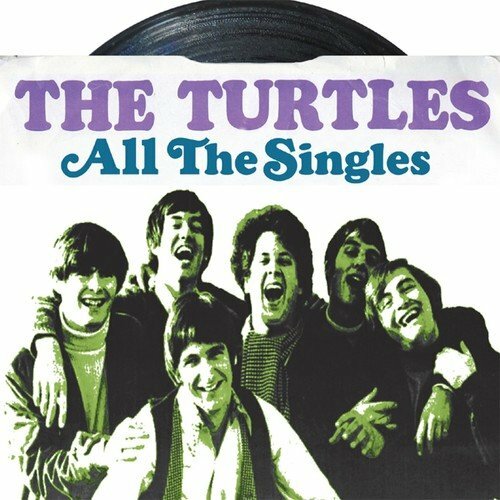 If you love the singles, then you really need to dig deeper and enjoy the heart of what made The Turtles an amazing band – their diversity. The first three albums are filled with gooey greatness. 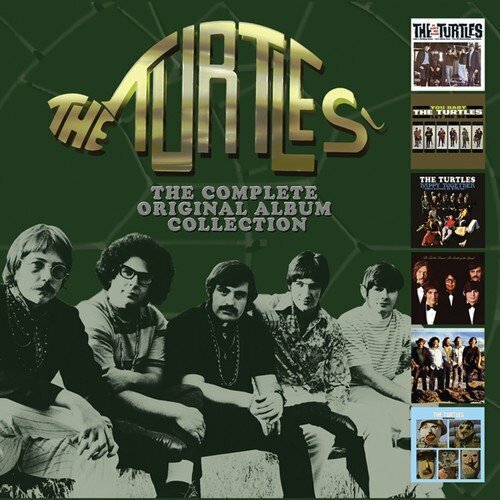 However, 1968’s Battle Of The Bands, which finds The Turtles portraying a different ‘band’ on each track, is a stunning tour-de-force. It is almost equaled by the follow-up, Turtle Soup, which is the only album Kinks leader Ray Davies produced for another band. Pretty impressive, indeed. And let’s face it, folks: in Howard Kaylan and Mark Volman (later known as Flo & Eddie), The Turtles had two great front men in one band. With exquisite vocals, stunning arrangements and top tunes (some written by the band, some written by others), The Turtles created a body of work that deserves critical reappraisal. Like, right now, man. P.S. And if all the above isn’t cool enough, Kaylan and Volman went on to work on loads of other people’s records including a stint with Frank Zappa and brilliant backing vocal work on a few classic T. Rex albums (including Electric Warrior). And there’s tons of info and thoughts about The Turtles that I haven’t even mentioned here! Knowing all of this, you really need to get yourself caught up on all things Turtles. You won’t regret it!